Our Soap Six-Pack Gift sets include six full size bars, each wrapped individually in our colorful cigar bands, and stacked inside a clear cellophane bag tied with raffia. With twenty theme combinations, from hand repair to goat milk, from floral and candy scents, to no scents at all, we've got a luxurious handmade soap gift for every one. We do reserve the right to substitute a fragrance here or there as necessary, especially during the busy holiday season, while still remaining true to the theme of the six pack combination. Six full size bars of handmade goat milk soap in a tall Cellophane Bag, featuring some of our favorite rose fragrances. A beautiful gift this holiday time of year, with Christmas colors selected to reflect the season. 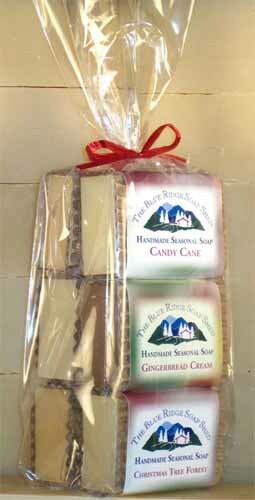 Soaps include Christmas Tree Forest, Cobbler Spice Cream, Frankincense & Myrrh, Gingerbread Cream, Marzipan, and Candy Cane. You choose the soaps you want us to include in this set - six different or six all the same. A beautiful gift during the Harvest months or anytime for those who enjoy spice scents. Six full size bars in a tall Cellophane Bag, including our year round best sellers. Six full size soaps in a tall Cellophane Bag, including Lavender Cream Goat Milk, Jasmine Hand Repair, Lilac Cream Goat Milk, Gardenia (known as Calendar Girl), Rose Cream Goat Milk and Magnolia Cream Goat Milk. A beautiful gift anytime of the year, with colorful colorful cigar bands for wrapping the soaps. You choose the soaps you want us to include in this themed set - six different or six all the same. Six full size bars of handmade goat milk soap in a tall Cellophane Bag, including our bestselling Oatmeal Milk & Honey. Six full size bars of our lavender soaps in a tall Cellophane Bag, featuring a variety of different fragrances combined with our beloved Lavender! Six full size bars in a tall Cellophane Bag, featuring our best selling soaps for men. 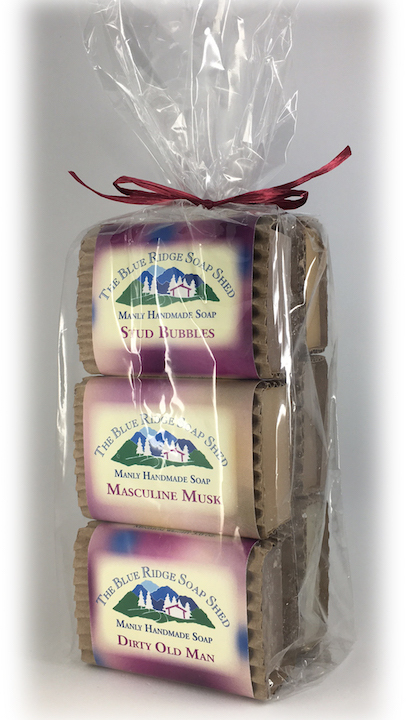 Six full size bars in a tall Cellophane Bag, featuring our Mountain and Blue Ridge soap scents. Six 100% natural soaps scented with natural essential oils: Lavender Cream, Lemongrass, Mountain Morning Wake Up Call, Patchouli Rose Geranium, Citrus Medley Shea, and Lime Spearmint Cream.